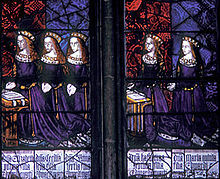 The five daughters of Edward IV and Elizabeth Woodville, (left to right): Elizabeth, Cecily, Anne, Catherine, and Mary. Royal Window, Northwest Transept, Canterbury Cathedral. Anne of York (2 November 1475 – 23 November 1511) was born in the Palace of Westminster, London, as the fifth daughter of King Edward IV of England and his wife, Elizabeth Woodville. She was First Lady of the Bedchamber to the queen in 1487-1494. On 5 August 1480, King Edward IV signed a treaty agreement with Maximilian I, Archduke of Austria. According to its terms, Anne was supposed to marry his eldest son Philip, the future Duke of Burgundy. The agreement also included the term that Maximilian would not pursue other contracts of marriage for the following three years. Maximilian was the eldest son of Frederick III, Holy Roman Emperor, and had a good chance for pursuing the title of the Holy Roman Emperor for himself later. His wife and mother to Philip was Mary, Duchess of Burgundy. Both relations made Maximilian a valuable ally for Edward IV. However, the marriage treaty was repudiated after Edward's death and was never concluded. As a sign of closeness between King Richard III and the Howard family, Anne was betrothed to Thomas Howard in 1484. After the overthrow of Richard III, Howard renewed his marital claim to Anne. At this time, Anne was attending her sister Elizabeth, wife of King Henry VII, as a lady-in-waiting. On 4 February 1495, Anne was married to Thomas Howard (later 3rd Duke of Norfolk) at Westminster Abbey. Howard was the eldest son and heir of Sir Thomas Howard, 1st Earl of Surrey (later 2nd Duke of Norfolk) by his first wife, Elizabeth Tilney. As Thomas Howard did not succeed to the earldom of Surrey or the dukedom of Norfolk until after Anne's death, Anne was never Countess of Surrey or Duchess of Norfolk. Their only son known with certainty was Thomas Howard (c. 1496 – 1508). In 1486, at the lavish christening of her nephew Arthur, she carried the chrisom. And in 1489, at the christening of her niece Margaret, later Queen of Scots, she again carried the chrisom during the ceremony. In 1510, her nephew King Henry VIII granted Anne and her heirs the various properties as compensation for the lands claimed in right of her great-grandmother, Anne de Mortimer, wife of Richard, 3rd Earl of Cambridge. These properties included the Castle and Manor of Wingfield and several other prominent properties. Anne died on 23 November 1511 and was buried at Thetford Priory. After the Reformation, she was relocated, along with other Howards, to the large aisle chancel of the Church of St Michael the Archangel, Framlingham. Anne and Thomas are considered to have survived their own children. He was a childless widower following her death. He later married a very reluctant Lady Elizabeth Stafford, daughter of Edward Stafford, 3rd Duke of Buckingham and Lady Eleanor Percy by whom he had surviving issue including Henry Howard, Earl of Surrey. ^ a b c d e f g h i j k l m n o * Lee, Sidney, ed. (1891). "Howard, Thomas II (1473-1554)" . Dictionary of National Biography. 28. London: Smith, Elder & Co. pp. 64–67. ^ a b c d e f g Douglas Richardson. Plantagenet Ancestry: A Study In Colonial And Medieval Families, 2nd Edition, 2011. pg 275. This page was last edited on 28 March 2019, at 01:13 (UTC).